Homes experience wear and tear over the years. While our floors receive lots of use, most people don’t stop to think about the use of our interior doors until they are noticeably worn. If you are ready to replace interior doors in your home, consider pre-hung doors for their stellar value and safety. A pre-hung door is created right at ASA Builders Supply and is delivered pre-installed within its frame, hinges and all to your home. 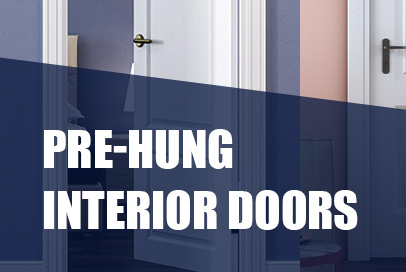 Pre-hung doors are available in many varieties which can enable you to change a room’s style. The traditional installation process for an interior door can be frustrating. Every measurement must be precise or else it won’t open and close properly. Since the door comes pre-installed, there’s no need to mess around with measurement tools. A door’s frame must remain intact structurally for it to be safe and function properly. A damaged door can fail, leaving you trapped in an emergency when you need to escape. In this case, replacing both the door and doorframe at once is the safest option. Now that you’ve learned about pre-hung doors, you can consider if they are the right option for you. Need help with selecting the right door? The ASA Builders Supply team is happy to help, stop by our showroom or give us a call. If you are planning to replace your interior doors, consider a pre-hung door that is placed within the existing frame making it convenient to install. These doors look great and offer several advantages compared to the others. Contact ASA Builders Supply for a free measure and estimate. With a distinct appreciation for style and flair, Masonite doors are timeless additions to any build. Featuring value, variety, quality, support, innovation and style, Masonite has dedicated themselves to creating high quality doors for over 80 years. By offering a wide variety combined with superior options and configurations, Masonite doors are sure to have the solution for your needs and is why ASA Builder’s Supply is proud to offer their products to the Detroit area. Masonite doors are built to last and feature high quality materials. The build quality of major components to your home building projects need to be durable. The company’s array of materials selection provide you maximum flexibility in meeting your particular project needs. As an innovative company, Masonite continues to create new and inspiring doors, all with the support of state of the art research & development facilities. By operating a private R&D facility, Masonite creates new technologies and materials to improve their already superb line of doors. Interested in using Masonite doors in your next building project? Call our team at (248) 624-7400 or visit us online to get started. More than just a door supplier, ASA has the materials you need for the largest of projects with stairs, cabinetry and more. Interior doors can make a world of difference in turning a house into a home. By using different materials and creating a look that is specific to your tastes, you can shape your personal spaces into your absolute favorite places. Exterior doors usually have the function of protection and being weather-proof but we at ASA Builders Supply specialize in interior doors that add spice, privacy and flavor to your home. Our sales team are skilled to provide the best service possible by meeting our customers face-to-face and learning about their wants and needs which not only builds a personal connection and trust but allows them to guide the customers for the best choices for their home. Our clients are able to consult about their ideal door model from molded styles to custom MDF doors, wood, glass, to mirror or metal. We offer many different frames and combinations for you to choose. We also have our own mill where many of our preassembled doors are created. If you wish to create a custom design, our team knows how to take care of you. We make the process easy from taking the measurements to installing the doors in a timely and professional manner. The process is hassle-free. The modest investment of updated interior doors can make a huge difference in the appearance of your home. You can create a better and more elegant sense of flow between rooms, as well as add privacy to rooms. Interior door upgrades will be an investment that pays in its returns, as you feel better about your home every time you enter a room. Small changes or additions make a huge difference in a home. 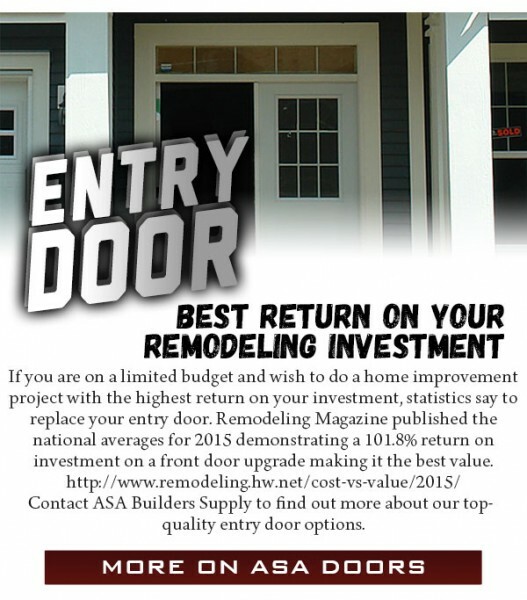 Contact ASA Builders Supply or visit our showroom to learn more. 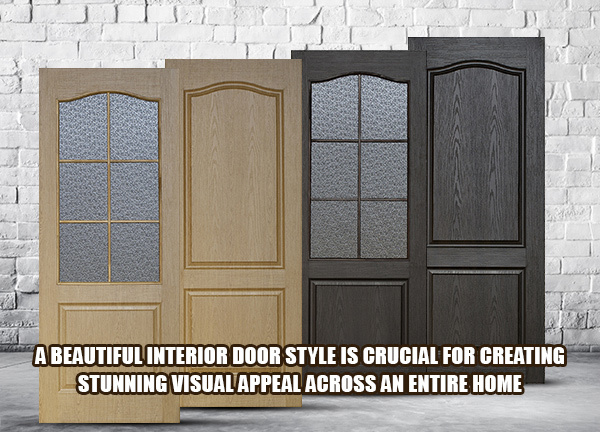 ASA Builders provides you with the largest selection and best quality of interior and exterior doors. 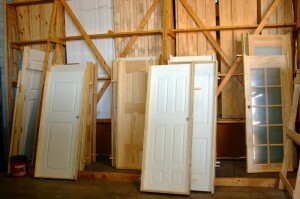 Your doors are tailored to fit your project and budget requirements. We have a large selection that are available for special order.